I was one of the early ones to wake up and drop off the huge sleeping bag in the main building. 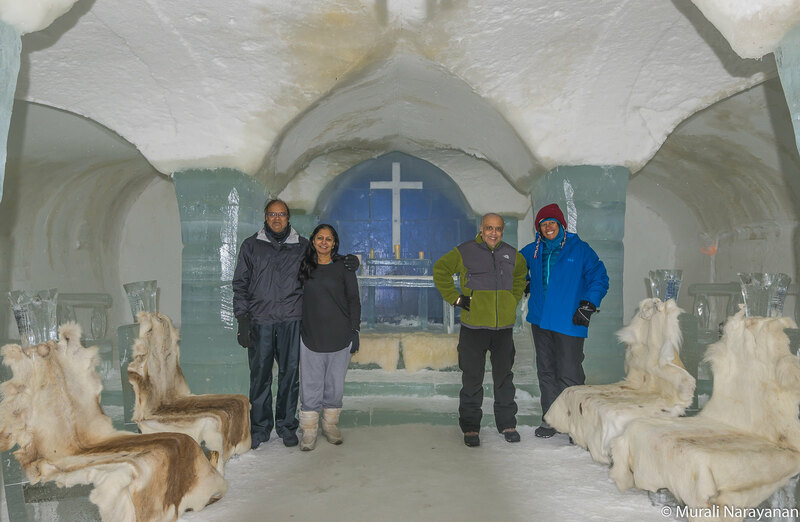 I washed my face and took another private tour of the chapel and the bar area in the igloo with my camera and tripod. There was nobody else in the vicinity. An hour or so later, the trio joined me to take a few pictures. We then finished a sumptuous breakfast and shot a few pictures outside. It was our 2nd cold but cloudless morning during our trip. 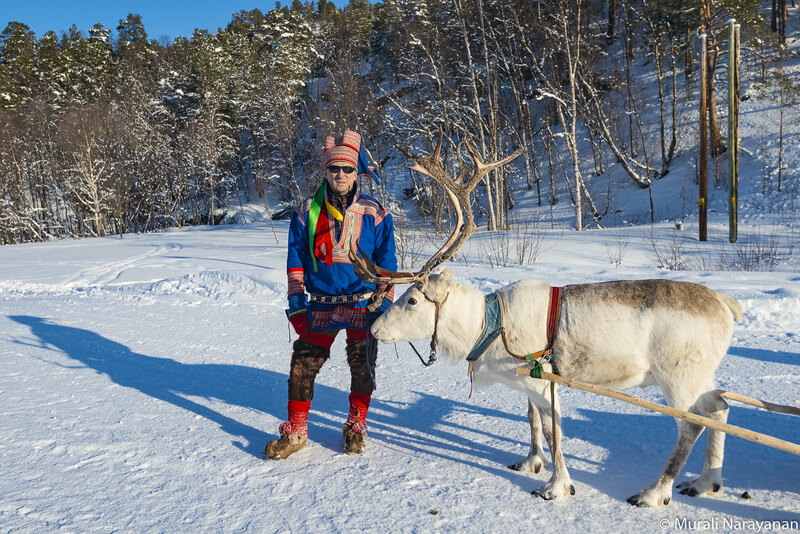 There was a local Sami reindeer herder at the hotel who does a 4hr reindeer tour at around 11am. As our flight back to Oslo was at 2pm, we skipped the tour but I captured an image of him with his lead animal. The trio did a bit of sledding while I was capturing some of the scenery around the property. We loaded the car at 11 and drove to the Alta Museum. The trio went inside and I was looking for any photo opportunities. They finished the tour at noon and we refueled the car and dropped it off at the airport. The flight to Oslo took off right on time at 2 and landed at 430pm. As the choice vegetarians at the Gardermoen Bed & Breakfast was rather limited, we decided to have dinner at the Peppes Pizza next to the baggage claim at the airport. The 2 pizzas, 2 beers, 2 coffees, and a hot chocolate set us back 520 NOK (about US$62). After dinner, we called the hotel to send us a shuttle. It came promptly and we reached the hotel at around 8pm. After some hot chocolate and fruits in the hotel lobby, we got to our room and repacked the stuff, took care of a few calls, email, whatsapp and FB posts and went to bed. The trio were on an 8am flight next morning to Bangalore via London and they checked out and left just before 6am. My Icelandair flight was at 2pm and I left the hotel by the shuttle at 11. The flight was on time and the 757 landed at Reykjavik at about 330pm. My connecting flight was at 445pm. The boarding area for the flight to Seattle was a zoo. There were about 5 US flights leaving at around the same time and I estimate that there were about 700 people in the small area. The flight was a few minutes late and the 7.5 hr flight back home was uneventful. Northern Norway is a terrific region to experience Arctic Winter and the Northern Lights. Although it is in the Arctic Circle, it is 20 to 30 degrees warmer compared to places in Alaska (e.g. Fairbanks) at similar latitude. Most of time we were there, the temperature was in the high 20s. Tromso and Alta were 5 to 10 degrees colder compared to Lofoten. The advantage of visiting the area in Feb or March is that you have 8+ hours of daylight and get the opportunity to view the Northern Lights. It is also less crowded and relatively less expensive. Winter weather is always unpredictable and due to heavy cloud cover throughout our stay in Lofoten, we only experienced the Northern Lights for 2 nights. An unintended side benefit was that we got decent sleep most nights. All the areas we visited were stunning. As photography was key factor, we rented a car that gave us maximum flexibility. 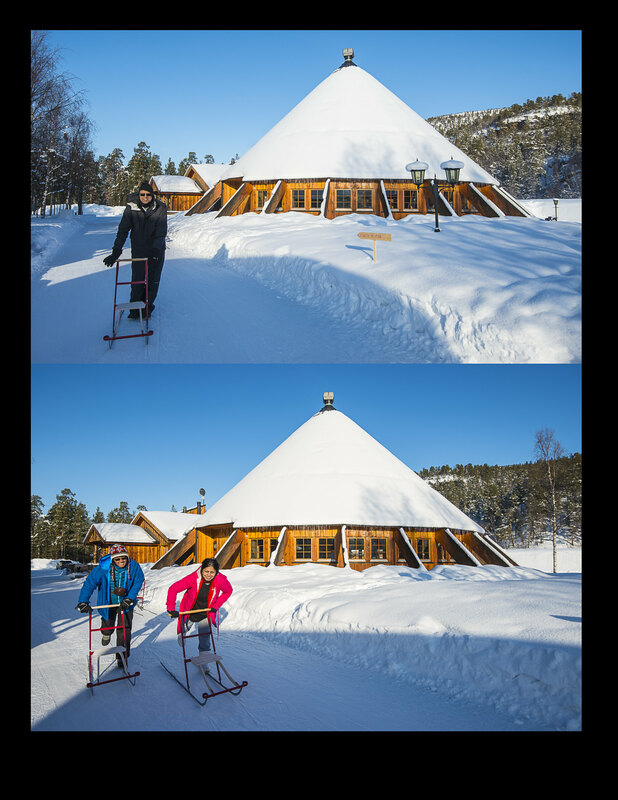 Norway does an amazing job of snow removal that we had no snow/ice issues. Although renting a 4×4 in Northern Norway is impossible, the station wagons we got had excellent studded tires and automatic transmission. While I took care of navigation, Dash did a bang up job of driving. We got full insurance. Don’t be penny wise and pound foolish. Although extra insurance cost us about US$20/day, every penny was worth it. In Iceland, when we returned the car, the rental car guy identified 2 minor scratches on the hood of the car. Most likely the scratches were there when we picked up the car. The charge to fix the scratches were close to US$2000. Luckily, with the full insurance package we obtained when we booked via rentalcars.com, we got 100% reimbursed. Full insurance will give you stress free driving on the winter roads. In Norway, the rental car drop off charges are enormous and so we decided to take the Hurtigruten from Stamsund to Tromso. It was a wise choice. The experience on the ship was wonderful and relaxed. 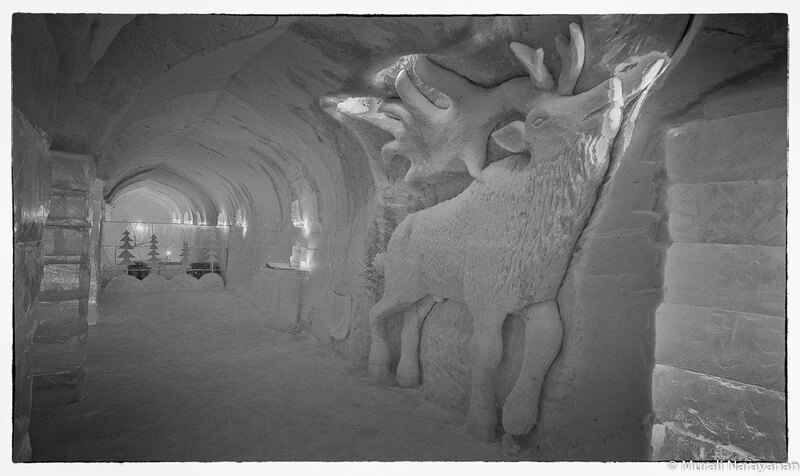 The Superior arctic cabins we reserved were comfortable and had a bathroom with shower. There are 2 dining rooms and a few lounges. The breakfast choices were plentiful and it is included in the US$220 per person fare for the trip. There were lots of photo opportunities between Harstad and Tromso at this time of the year but we missed the famous and dramatic Trollfjord as the ship passed it at 11pm. To experience this fjord, you need to go in the summer. The crew also conducts lectures in the auditorium and we found the one we attended about the Hurtigruten ship, MV From, very interesting. You don’t need a lot of gear to do landscape photography. I carried 2 Nikon DSLR bodies, one an FX D800E with the 16-35mm f4 Nikkor and the other a DX D7100 with the 24-120mm f4 Nikkor. I used a B+W Kasemann Circular polarizer to reduce reflections and to slow down the shutter speed. A solid tripod and ballhead is a must as it is quite windy everywhere. On this trip, I carried the Feisol CT-3402 carbon fiber tripod and a Markins Q20 ballhead. I felt the Feisol was not good enough to handle the arctic winds. Next time, I will take my real workhorse, the Benro C-327 which weighs 1.5 lb more but provides much better stability. Nikon battery life was quite good as I could shoot pretty close to 2 days with a lot of chimping on a single charge. For Northern Lights photography, I used the 20mm f1.8 Nikkor on the D800E. Cody Duncan is an amazing photographer and workshop conductor in Lofoten. His e-book on Lofoten in Winter was my bible to plan the Lofoten portion of the trip. He provided additional ideas and guidance via email. I used Google Earth, 500px, and Flickr to identify the locations. I then added them on Google Maps that you can find here. I then imported the POIs into the POI Viewer app on my iPhone6 and launched Navigon Europe to take us to a particular spot. There are only 2 simple requirements to experience the Aurora Borealis in all her glory. (1) Clear skies. (2) No light pollution like city lights, cars and joggers with their head lights/lamps on. A nice foreground (e.g. a photogenic mountain) is a plus. (1) Go on a conducted tour. Although this option is quite expensive @ about US$80-160 per person depending on the type of transport, the guides know where to go. They track cloud cover very closely and will drive even to Finland to significantly increase the odds of experiencing the light show. Mini bus tours cost about US$150 but they have more options to locate and park the vehicles at optimum spots. As the number of people in the minibus is about 10, it is much easier to decide to return early if you had a good viewing. This option will work for a majority of the people. (2) Do your own chase. This requires a lot planning. You need to drive during day time to select spots with ample parking and good foreground. This may take you 1 to 2 days of driving. When you are ready to do the chase, go to yr.no and check out the cloud cover forecast for that night. You then drive to locations you have previously identified that have clear skies. There are reasonable options for vegetarians in Leknes and Svolvaer (Lofoten) and Tromso. Everywhere else, self catering (aka cooking in your cabin) is the cheapest and best choice. The groceries in Norway in general are 2-3x as expensive as in the US but pretty much everything is available. The choices are more limited and prices are much more expensive outside of big towns and so load up on groceries before leaving. Thanks to booking.com we had excellent kitchens every where we stayed.